Jeff moved with his family t o Durham, North Carolina from Montana at the age of 13. Starting as a freshman at Northern High School, he played all 4 years on the varsity golf team. 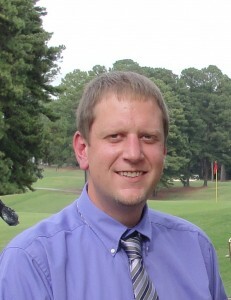 After graduation Jeff moved to Greenville, North Carolina to attend East Carolina University. Jeff graduated from ECU with a Degree in Recreation and Leisure Studies; and a concentration in Commercial Recreation and Tourism. Jeff has been at Wildwood Green since March, 2009 and has learned the operation from top to bottom by starting out as an intern cleaning the golf carts. Jeff then became the Operations Manager and Tournament director and has recently been moved to the General Manager and Head Professional position.